Of all the pasta salads I’ve tried, this one is definitely still one of my favorites and in the “don’t make it often as I’ll eat it ll in a day” category. It’s light and refreshing, perfect on a hot summer day, for a picnic lunch, or for the beach! 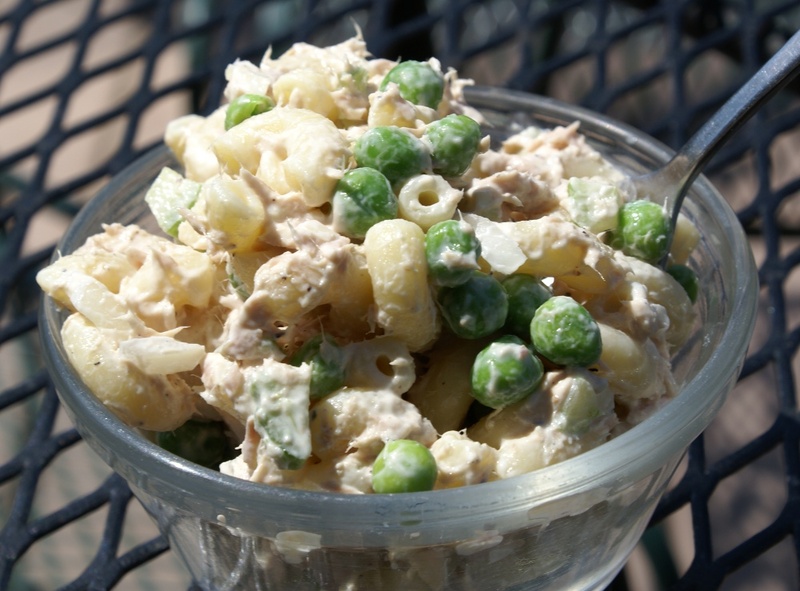 The celery is a MUST, even if you normally don’t like celery (like me) as the added crunch adds so much to this salad…that and the sweet burst of peas along with the comforting flavor of noodles and tuna, YUM! Surprisingly, even though this has 2 cans of tuna in it I do not find the flavor to be overly “tuna-y”, but if you are a bit hesitant start wit just 1 can. Oh, and if you are not a big fan of mayo based dressings you should still give this a try, trust me. You could also lighten this up by using reduced fat mayo. Add the first 8 ingredients in large mixing bowl and blend well. Taste and adjust the salt, pepper, and sugar level to your liking. The dressing will look a bit watery, this is ok.
Add in the noodles and peas, blending well to make sure all of the noodles are covered in the dressing. Cover and refrigerate for an hour. Un-cover and mix the salad well to re-distribute the dressing, then cover again and refrigerate for another 3 hours before serving. This can be made a day ahead for picnics and such, it taste’s even better on day 2! This looks delicious! I printed the recipe to try for myself!! Actually all of your food looks so wonderful!! The best ever! So glad I found this recipe. Wouldn’t change a thing about it. Thanks for sharing. Looks absolutely wonderful, can’t wait to try it!